A 5-year-old recipient of Welcome Boost funds poses in a new sweater purchased with KKOOM support. This year we launched the “Welcome Boost” Program to provide funds to purchase clothes and basic necessities for children who arrive at orphanages with almost nothing, sometimes just the clothes on their backs. To date, we have provided 150,000 won (about $125USD) for six children. The most recent recipient of Welcome Boost funds is a 5-year-old girl who arrived at the orphanage late this fall. She was discovered living with her mother, who has an intellectual disability, in a house that was described as a pile of trash. While these circumstances are extremely unfortunate, she is now living in a healthier (and much cleaner) environment at the orphanage home and has been adjusting well so far. She celebrates her birthday with the girls in her house. Her house mom at the orphanage used the Welcome Boost funds to buy her winter clothes, including a warm coat, hat and gloves. New clothes helped make her transition in her new life a little easier. 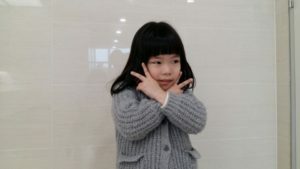 She now has nice clothes to wear to her new preschool, and she can take pride in showing off her cute smile, as above. 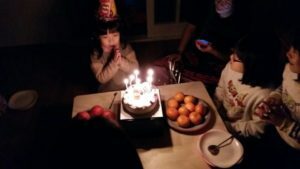 Recently, she also celebrated her birthday with her house family, as you can see at right. While the circumstances that bring children to the orphanage are heartbreaking, thanks to your support, we’re able to make the adjustment a little easier by providing for their basic needs. If you’d like to help us continue this work, please consider making a year-end donation by clicking the “donate” button at the top right of this page. To find out more about the Welcome Boost Program, please check out our earlier posts here and here.